American Childrens Theatre - Camp fun and special workshops! Camp fun and special workshops! Don't miss our Wonderfully Warm Winter break camps! Looking for fun activities for your children this Winter break? 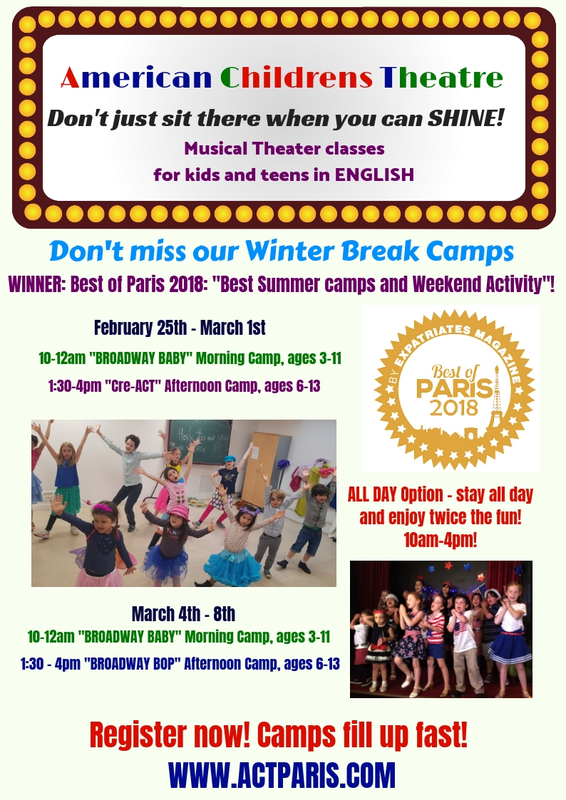 Why not choose the 2018 Best-In Paris WINNER for"Best Childrens Summer Camps and Weekend Activity" ! and put on a great show for parents and friends on Friday! 10-12am Broadway Baby Morning Camp, ages 3-11- a fun week of musical theater! The children work on a short musical show to perform for you on Friday! 1:30-4pm Cre-ACT Afternoon Camp, ages 6-13 - Students learn the basics of how to CREATE their own show! We work on how to build their own characters and stories, even to how to choose a costume to best express that character! Students will work on improvisation skills and games, to build a story or short skits to perform for you on Friday! This is a fun, creative way to learn how to express yourself! ALL DAY Option - stay all day and enjoy twice the fun! 10am-4pm! Add-on Lunch, 12-1:30pm Or, just come early or stay later for lunch, to add-on to a morning or afternoon session! 1:30 - 4pm Broadway Bop Afternoon Camp, ages 6-13 - a more challenging session for older students! This session works on slightly more challenging material to put in the Friday show! All- day Option and Lunch Add-on options available! Students may sign up for one or multiple sessions! Weekends just got more show-stopping! Throughout our fall season we'll be hosting a variety of different workshops in theatre and dance open to ACT and non-ACT students. We are offering dance workshop classes in tap, jazz and Hiphop dance as well as fantastic drama workshops in clowning, improvisation and character! This is a great chance for students to learn new skills and to work on specific aspects of their performance ! Workshops are payable per class and tariffs are posted at the bottom. Commercial jazz and street dance workshop working on choreography in the style of the smash hit TV show GLEE! Students will work on some basic combinations, create some of their own choreography and learn a full dance routine to a well known pop song. What makes us laugh? How can we be funny? No big shoes or fake flowers here, Neil will teach you the real art of clown comedy...red noses will be provided! Tap your troubles away with this fun workshop. We'll work on fundamental tap techniques/steps and learn a choreography to a well known song. Suitable for all levels from beginners to experienced tappers. Learn how to think on your feet and get wildly creative with this introduction to improvisation. Both challenging and exciting, this theatre technique will allow you to use quick thinking to create brilliant characters and stories. Using fun games and exercises we'll be looking at some weird and wonderful ways to create believable characters for the stage. Hear the beat of dancing feet and join our dance teacher Lisa at a fabulous 42nd Street themed tap workshop. Learn or review some basic steps, create some of your own choreography and then get ready to razzle dazzle with a dance inspired by the West End production. An introduction to experimental scene work. Learn how to take a written scene from a script and turn it into something new and exciting for the audience! In this workshop the only limit is your imagination! Don't throw away your shot! Come and learn a routine inspired by the Broadway and WestEnd hit HAMILTON. The dance style is a fusion of Broadway and Hiphop. Learn to theatricalise and put in motion the work of famous painters. 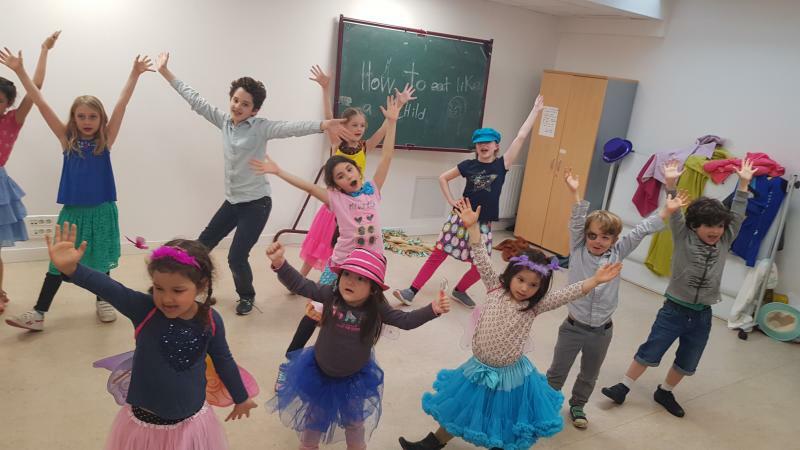 This workshop is led by Anya Opshinsky, an American actress and director trained at the famous Ecole Jaque Lecoq. From a young age we are taught to move to music, it becomes second nature for our bodies to start to sway when we hear a beat. This transfer of creativity from one art form to another feels natural and instinctual but what about the line that connects other art forms to one and other. Why don’t we sing when we see a sculpture or paint when we hear music? During this two our workshop we will learn to move to the works of famous classical painters from Monet to Kandinsky. We will start by exploring the world of color to understand the rhythm, shape and tempo of the different colors and shades in the color wheel. We will then study a series of classical paintings by artists such as Vincent Van Gogh, Edward Hopper, and Wassily Kandinsky. We will create a series of moving images and scenes that portray the mood, texture, color and styles present in the paintings. Registration fee: 25 per family, per year, and good for all classes and camps within that school year! We offer specialized workshops throughout the year, on weekends or during school holidays! Some are taught by our very talented ACT team, or we bring in special guest teachers as well! Chryssie Whitehead - Chryssie is an experienced Broadway performer and dancer with credits on Broadway and in shows like "Chicago", "A Chorus Line" and "Company", and in American Regional productions and national tours of shows like "Cats", "Fosse", "Damn Yankees" and more! Georgia Gray - Georgia is a professionally trained singer from New Zealand with a background in classical singing and opera. Creating Character - how to build and imagine a character from "scratch"
Shakespeare at Play - taking the intimidation factor out of the Bard's work, finding the fun! Adapting a story - how can you change or play with an exisiting story to find new perspectives or interest? 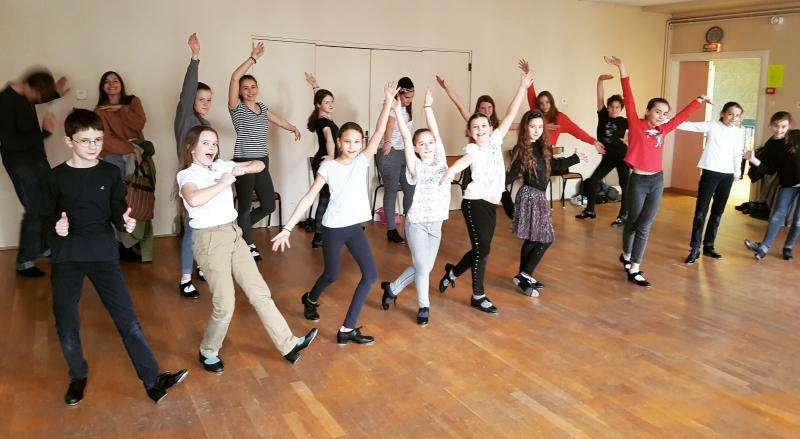 TAP DANCE Workshops! - learn the basics of some tap steps and a dance to perform at the end! Hip-Hop Workshops! - Learn some fun "street dance" and hip-hop style! How to Perform a song - learn how to truly "sell" a song to your audience, to captivate and enchant them! Musical Theatre Intro! Learn a song and dance to perform for parents at the end! Clowning Around - Can YOU be a clown? * Workshop costs range from 10 to 35 euros, depending on material required and length of course or special guest costs, and are listed with workshop posting.